Commercial pesticides and herbicides were introduced to Cuban agriculture in the 1940’s. After World War II, the effects of DDT, aldrin, chlordane, 2, 4-D, and other, new chemicals were recognized. Internationally, DDT became popular as a wide range insecticide, and 2, 4-D as an herbicide for use in grass crops, including corn (Delaplane 1996). Over time, new varieties of agrochemicals were developed and put into commercial use. Cuba relied heavily on these external inputs to guarantee higher production, as many agricultural areas throughout the world did, and continue to do so. However, by the 1970’s Cuba began exploring Integrated Pest Management as an initiative of the newly created National System of Plant Protection (Nicholls 2002). 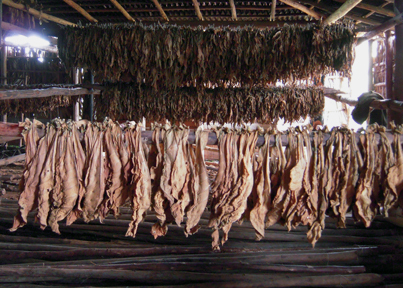 The National System of Plant Protection, referred to in other academic sources as the Cuban plant health system, was not so much a formal policy, as an overarching agenda which included the eventual construction of plant health laboratories, plant protection stations, and reproduction centers for entomophagous (organisms that feed on insects) and entomopathogenous organisms (organisms that parasitize insects) (Roettger 2003). Integrated Pest Management became the national policy in 1982 (Funes 2002), although other researchers have noted that prior to the collapse of the Soviet Union the IPM technologies were rarely utilized (Rosset 1995). Since then, while much of the world still relies on agrochemicals for food production, Cuba has become recognized as a model in transitioning to a more sustainable, low input style of agriculture. After the revolution in 1959, the face of agriculture in Cuba changed rapidly and continuously. The Agrarian Reform Law of 1959 nationalized all large private farms over the size of 402 hectares, including those owned or run by the United States (Mears 1962). The United States had a significant interest in Cuban sugar, and many of the largest, redistributed farms were sugarcane plantations, funded and controlled by U.S. investors. The United States embargo against Cuba was enacted in 1960 by President Eisenhower, halting all sugar purchases from Cuba by the U.S., discontinuing any oil trade with Cuba, and beginning a partial economic embargo. The embargo was further tightened by President Kennedy in 1962, and in 1963 it was declared illegal for any U.S. citizen to have financial or commercial transactions with Cuba. Among the vast number of other bans, all agricultural commodities, including farm machinery, seeds, plants, livestock, and agrochemicals, were no longer accessible for Cuba from one of its closest trade partners, the United States. The Agrarian Reform Law of 1963 nationalized the land of any farm over 67 hectares, bringing the total percentage of land owned by the Cuban government to 70% (University of Florida 2004). After the revolution, Cuba established a strong relationship with the USSR. From 1959 until the downfall of the Soviet Union in 1989, 85% of Cuba’s trade was with the Soviets. The USSR bought sugar from Cuba at a preferential price, up to five times the world market price. Cuba bought 90% of its fuel and 80% of its fertilizer and pesticide imports from the USSR (Warwick 1999). As the Soviet Union fell, Cuba plunged into an economic depression known as the Special Period. To keep the country from starvation, Cuba needed to find new trading partners or find a way to feed itself. In 1992, President Bush passed the Torricelli Act, also called the Cuban Democracy Act, which prevented foreign subsidiaries of U.S. companies from engaging in trade with Cuba, and stipulated that any ship that used a Cuban port in the previous 180 days could not enter a U.S. port (U.S. Department of State 1992). Establishing new trade was made difficult, and in the Special Period, Cuba launched forward with alternative agriculture, learning to use local resources and disband reliance on other countries for fertilizers and pesticides. Many of the alternative farming practices adopted in the Special Period involved returning to a more comprehensive, holistic approach to management. Integrated Pest Management is just one example of this. The EPA classifies IPM as “the coordinated use of pest and environmental information with available pest control methods to prevent unacceptable levels of pest damage by the most economical means and with the least possible hazard to people, property, and the environment.” Integrated Pest Management is based on the principle that careful observation, planning, and action can reduce or eliminate pest problems in a safer and more efficient way than the spraying of a multipurpose pesticide. It also focuses on prevention through a number of smart farming techniques (EPA 2012). In Cuba, farms use Integrated Pest Management to varying degrees, picking and choosing from IPM techniques to find which are most viable and effective for a specific crop, land, and location. 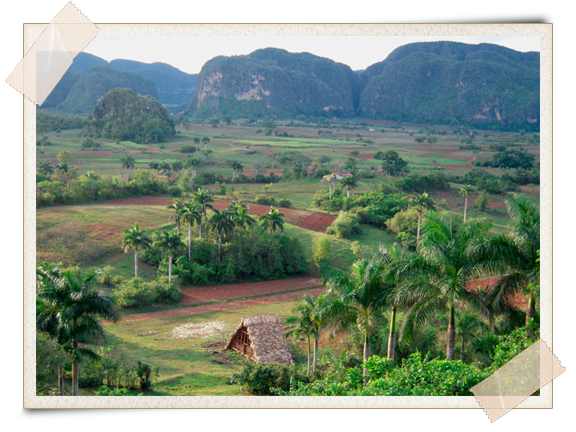 In 2008 the Cuban government started allowing for the redistribution of underused or unused state land to local farmers (León 2012). Many of these farmers have embraced the farming skills adapted during the Special Period, and have further extrapolated upon them to suit their own farming needs. One widespread practice is the use of entomophagous and entomopathogenous organisms. Reproduction centers for entomophagous and entomopathogenous organisms (CREEs) were created rapidly once the depression hit Cuba. By 1992, 227 centers had been built on the island, and by 1997, 280 existed. CREEs provide services not only to state farms, but also to cooperatives and private farms. Their main objective is to provide a low priced product for local farmers, and in fact most CREEs operating on a cooperative’s space offer the cooperative the product for free (Nicholls 2002). One of projects of the CREEs is the rearing and distribution of the entomophagous Trichogramma. Trichogramma is a genera of wasp which parasitizes the eggs of hundreds of species of insects, including moths, butterflies, sawflies, fruitworms, beetles, and flies (UC Davis 2012). The CREEs breed the wasp by collecting colony stocks from local crops that the reared wasps will later be released onto. The centers keep eggs of Corcyra cephalonica or Sitotroga cerealla, a rice moth or grain moth, respectively, to allow the wasps to infect them. Once they have hatched from the initial batch of parasitized eggs. Cuban farmers use Trichogramma to kill the cassava hornworm, the tobacco budworm, and the sugarcane borer. In total the CREEs produce almost 10 billion wasps each year (Nicholls 2002). 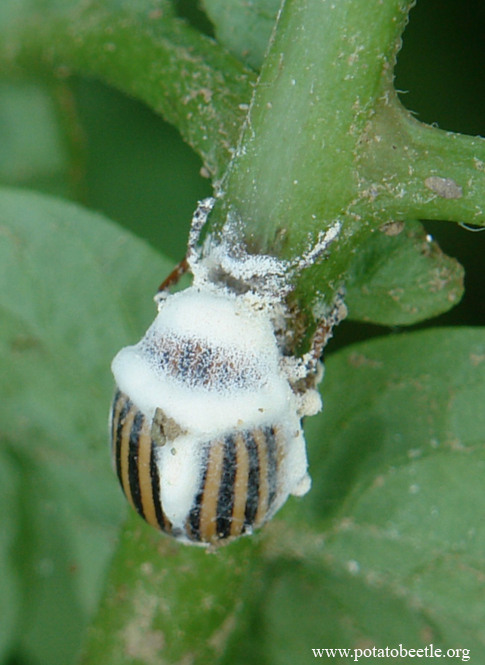 The use of Trichogramma as a predator for harmful plant pests is an example of biological control. “Biological control is a component of an IPM strategy. It is defined as the reduction of pest populations by natural enemies and typically involves an active human role” (Hoffman 1993). This ideology summarizes well the agenda of IPM in Cuba: using nature inspired methods to foster plant health and productivity. Entomopathogenic fungi and bacteria are also produced by CREEs. CREEs are particularly instrumental in making biopesticides from Bacillus thuringienis (Bt). The centers multiply the bacteria and ship vials of Bt to any of the three Biopesticide Product Plants located in Cuba. Biopesticides from Bt are currently the most used biopesticide, making up 90% of biopesticide used worldwide. The biopesticide is in a liquid form and is sprayed on plants. Bt can provide mosquito and lepidopteran (moth and butterfly) larvae control. Moths and butterflies can otherwise cause significant loss in corn crops and cruciferous vegetables. Additionally, the biopesticide is used to combat the tobacco budworm, cassava hornworm, potato and citrus leafminers, and mites (Fernández-Larrea Vega 1999). Bacillus thuringienis is also used in aiding soil health. Because some soils in Cuba can be high in aluminum and iron oxides, phosphorus can become unavailable for uptake by plants if it complexes with either. Bt is a phosphosolubilizing bacteria. This means that when the bacteria consume the complex, phosphorus is detached from the other chemicals and made available for plant use again (Oppenheim 2001). An entomopathogenic fungus is used by Cuban farmers to combat the sweet potato weevil. The sweet potato weevil is a pest worldwide, but particularly in subtropical and tropical areas. The fungus Beauveria bassiana can be dispersed by spraying a topical solution on the leaves of the sweet potato plant, or can be used in combination with a pheromone trap to infect the sweet potato weevil. Cuba is noted for its success in producing significant amounts of the fungus, although production is decentralized in a number of small scale facilities (Korada 2010). A second technique used to control the sweet potato weevil is the use of predatory ants. 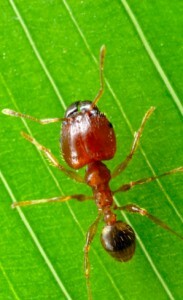 The bighead ant, Pheidole megacephala, is found in banana plantations. Cuban farmers use a technique of rolling them up in banana leaves to transport the ants to sweet potato fields where the ants are let loose to enjoy a feast of sweet potato weevil (Korada 2010). Another plant based method for preventing pest problems is intercropping with maize in vegetable and row crops. This is used to lessen the effects of Thrips palmi, commonly known as melon thrips, an insect which harms plants by eating the leaves, stems, and flowers (Nicholls 2002; Martin 2007). The melon thrip feeds on many plants, including eggplant, pepper, potato, cucumber, various beans, cotton, tobacco, soybean, and other vegetables, tubers, and grains (Martin 2007). The maize plants produce pollen which attracts natural predators of Thrips palmi, especially the Orius species, which are collectively called minute pirate bugs. Intercropping is inherently beneficial for reducing pest damage as it distributes the insects over a larger number of plants in the same area (Nicholls 2002). 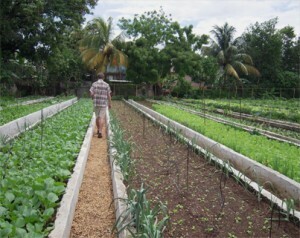 Urban farms are popular in Cuba, notably in the capital city of Havana. Organoponicos are the most common type of urban agriculture, and are characterized by raised or cement encased plant beds (Taboulchanas 2000). These organoponicos benefit from many of the aforementioned IPM techniques, but some are simply not feasible in a city setting. For instance, releasing thousands of wasps would not please the surrounding community. Intercropping is an example of IPM that is well suited to both rural and urban settings. Unlike a traditional farm, plants in organoponicos are not grown in extensive rows, therefore intercropping occurs on a much smaller scale. Intercropping is the practice of growing plants close together for the purpose of increasing yield per unit of area. A closely related term is companion planting, which is the practice of growing plants close together to benefit the development of one or both of the plants (Penn State University 2012). So although intercropping can be used in an urban farm, often the term companion planting is more applicable. A common example of companion planting is that marigolds and tomatoes are planted together, since marigolds repel insects, including aphids, which are a frequent pest for tomato plants. 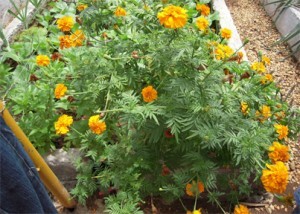 The combination of marigolds and tomato plants is used by backyard farmers everywhere and by most farmers in Cuba. Many organoponicos plant garlic, onions, and certain herbs around and within plant beds to prevent insects from invading the bed. Garlic is an ideal companion plant for tomatoes, peppers, eggplant, cabbage, broccoli, kale, and carrots. Garlic repels aphids as well, and the plant is capable of amassing sulfur, which is a natural fungicide (Vanderlinden 2012). In the extensive network of urban farms in Cuba, employing plants for biological control is necessitated and well substituted for entomophagous insects. The progress Cuba has made in agriculture since the collapse of the Soviet Union has proven to the world that sustainable agriculture in not unattainable. Through implementation of comprehensive farming practices, such as those encompassed in Integrated Pest Management and biological control, the country has been able to keep farms once founded on the principles of conventional agriculture operating. The country does receive criticism, as 80% of its food needs are still imported (Agriculture and Agri-Food Canada 2012).  Some observers believe that if given the resources, Cuba would quickly return to a pesticide, herbicide, and synthetic fertilizer based system of production. In recent years Cuba has created political and financial alliances with Venezuela and China (Agriculture and Agri-Food Canada 2012). Cuba’s relationship with Venezuela has opened up trade for oil once again, one of the most important inputs needed for making pesticides and fertilizers. While Cuba continues its path to recovery after the Special Period, many are watching to see how Cuba’s policies on sustainable, low input agriculture will develop. Delaplane KS. 2002. Pesticide Usage in the United States: History, Benefits, Risks, and Trends. Athens, GA: Cooperative Extension Service, The University of Georgia College of Agriculture and Environmental Sciences. Fernández-Larrea Vega O. 1999. A review of Bacillus thuringienis (Bt) production and use in Cuba. Biocontrol News and Information 20:47-48. Funes F, Garcia L, Bourque M, Perez N, Rosset P, eds. 2002. Sustainable Agriculture and Resistance: Transforming Food Production in Cuba. Food First Books p. 110-111. Hoffmann MP, Frodsham AC. 1993. 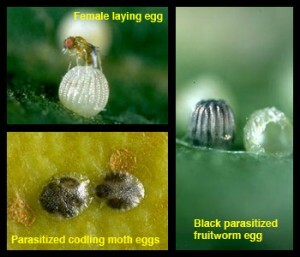 Natural Enemies of Vegetable Insect Pests. Cooperative Extension, Cornell University, Ithaca, NY. p 63. Korada RR, Naskar SK, Palaniswami MS, Ray RC. 2010. Management of sweetpotato weevil [Cylas formicarius (Fab. )]: an overview. Journal of Root Crops 36:14–26. León JJ. 2012. [Lecturer] A Briefing on Cuban Agriculture. Presented on May 2, 2012. Mears LG. 1962. Agriculture and Food Situation in Cuba. ERS-Foreign 28, Economic Research Service, United States Department of Agriculture, Washington D.C.
Nicholls CI, Perez N, Vasquez L, Altieri MA. 2002. The development and status of biologically based integrated pest management in Cuba. IPM Reviews 7:1-16. Oppenheim S. 2001. Alternative agriculture in Cuba. American Entomologist. 47:216–27. Rosset P, Cunningham S. 1995. The Greening of Cuba. Earth Island Journal 10:23. Warwick H. 1999. Cuba’s Organic Revolution. The Ecologist 29:457-460.